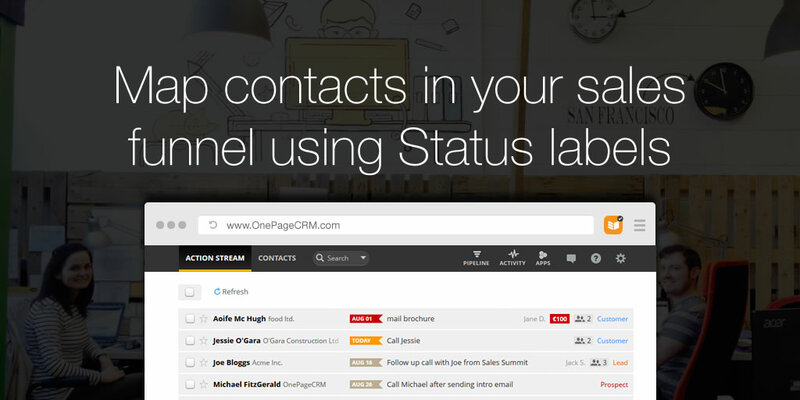 Using Status labels in OnePageCRM helps you to manage each stage of your sales pipeline. By setting a Status for your contacts it focuses the entire organisation on moving contacts through the sales funnel. Why should you use Status Labels? Increasing productivity is key in business. Using status labels the right way can help your employees reach their full potential. As for salespeople, reaching the next milestone with a contact can often be a small but very fulfilling victory. 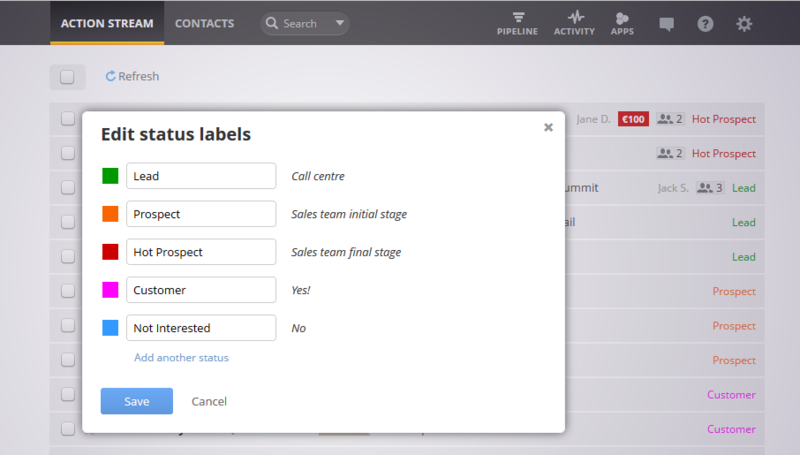 Status Labels in OnePageCRM allow you to reflect on the sales process. They are also useful for allocating responsibility to different departments. For example, the call centre staff may contact and qualify leads. Once they’re converted from being a “lead” to a “prospect”, they’re passed to the sales team. The sales staff then begin work on convincing the prospect that their product / service is the right fit for them. Statuses are also an excellent way for management to identify whether their workflow is successful or not. Evaluating the stage of the process where the potential customer drops may be an indication that something is wrong. For instance, if most leads never even make it to the prospect stage, you need to ask yourself, is the quality of my leads bad? Does my call centre personnel need more training? Maybe the whole “qualifying” process needs to be redefined. Alternatively, if high volumes of prospects are dropping off at the prospect stage, the sales techniques may get called into question. Managers may often use status labels to help implement a bonus structure into the organisation based on conversions. For example, if team members convert 100 leads to prospects, they may awarded some form of remuneration. This information may also be beneficial to the HR department of the company when conducting performance appraisals. When assessing the employee’s progress within the role, status labels can act as an indicator. Is the employee evolving within the role or being taken over by the role itself? First, you need to decide, how many steps there are in the sales process (this may vary depending on your industry). There is a colour coding “palette” option for you to customise. This is particularly useful when your contact appears in your Action Stream. The status text appears in that colour which instantly draws your attention to it. Step 1 – Call centre personnel call the potential client to “qualify” them, we name this contact a “Lead”. This initial call is to see if they are interested in placing a recruitment ad with the company. Based on the outcome of the call you either qualify them as a “Prospect” or move them to the “Not interested” stage. Step 2 – “Prospects” are passed to a member of the sales team who will then liaise with them regarding their ad specification, design and of course pricing. If the “Prospect” shows enthusiasm, then great, you can now move them onto the next stage which is a “Hot prospect”. Step 3 – After much negotiation and they are happy with the ad and price, places the order – the “Hot prospect” now becomes a “Customer”. This indeed was a very straightforward workflow – often there may be several actions associated with the contact at the various stages in the sales cycle. However even after the prospect becomes a customer, the process does not end here. Now is the best time to keep your customer engaged using OnePageCRM’s unique Next Action follow up method and retain them as a lifelong customer. So I’d recommend to start using status labels to get your own workflow moving!